In cities and towns filled with tall buildings, New Yorkers are constantly riding elevators and escalators. People with physical disabilities often depend on them to move from one floor to another. Most individuals trust that elevators and escalators are safe to ride and will not cause them harm. Unfortunately, this is not always true, especially when they are improperly designed, poorly maintained or certified inspections are not performed or done improperly. The result can be serious injuries and even fatality. Injuries and fatalities from elevator or escalator accidents can result in hardship for individuals and their loved ones due to medical and hospital bills, the inability to work and perform their usual family obligations. If you or a loved one has been injured in an elevator or escalator accident, don’t wait! ARDITO LAW FIRM, P.C. works with qualified experts, such as engineers, who can give scientific testimony that relates to your accident when necessary. It is essential that you contact ARDITO LAW FIRM, P.C. 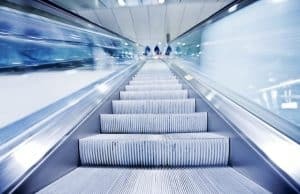 as soon as possible following an elevator or escalator accident, which can be an invaluable step in preserving evidence that can be crucial to your case.